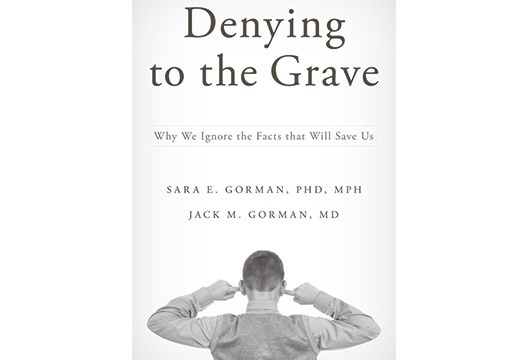 'Denying to the Grave: Why We Ignore the Facts That Will Save Us' by Sara E. Gorman & Jack M. Gorman (Oxford University Press; Hb £22.99); Reviewed by Christopher Boyle. In this engaging and illuminating book the authors attempt to understand the psychology behind why people ignore scientific evidence in order to believe in alternative possibilities. The obvious example is that of climate change, where there is a reasonably large group of people, who deny the scientific evidence that human interaction with the environment is having a negative effect on the planet’s climate. As a previous resident of Australia this reviewer recalls the ex-PM of Australia, Tony Abbot, a proud sceptic of many things, stating that ‘climate change is a lot of crap’. The authors highlight the apparent stupidity of intelligence in that there is a ‘direct relationship between intelligence and not vaccinating children’. The book offers key principles to adhere to, as well as solutions to help people understand the issues around the absence of facts in science. After all, there are very few absolutes in science, especially that of medicine, but there are statistics and probability. The authors argue that therein lies one of the issues: many people are not educated in the nature of science in that absolute facts do not exist. There are many variables, which can be confusing, and obfuscation can be easily practised if so required. As many scientists use hypothesis testing to put forward findings, which cannot be regarded as being unconditionally correct, the authors state that ‘many people can be uncomfortable with this’. A solution put forward is that members of the science media should be better trained to present information in such a way as to ward against the ‘mistake in some science journalism [of] accepting the absence of evidence as signifying the evidence of absence’. The authors advance some guiding principles based on their findings. Quite often one can presume that irrational beliefs are based on having a poor education, but the authors are very clear that a good education is no barrier to a poor belief system. Being human means that people are more susceptible to emotion than to statistics. The authors suggest that charismatic leaders are usually very good at the appealing to the former, hence many people can be duped by the charm of a persuasive speaker. Finally, people can have trouble changing their minds once their beliefs are in place. This can mean that despite evidence showing a contrary position many people prefer to stick to their original thinking for a considerable time, presumably until the weight of evidence becomes overwhelming.